What’s today, you ask? I’m so glad you did. It’s release day for the first ever Nocturne Falls Universe stories! There are six in total and you can find all the links here. And if you want to know more about the Nocturne Falls Universe, you can read the FAQs here. But now for the big news. The giveaway. 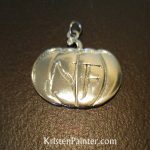 I’m giving away a Kindle Fire (or a $25 Amazon GC if you’re an international reader) and ten of those fabulous silver Nocturne Falls pumpkin charms in the picture! How do you enter? See below! ← Six new books in the Nocturne Falls Universe!